Amy was introduced to Pilates in September of 2001--one month after the death of her younger sister. During this time, Amy was overweight and exercised infrequently, and through Pilates began to see healing after this devastating loss in her body, mind, and spirit. She found the center of who she is through the power of Pilates. She founded Centered to help others find healing like she did, in body, mind, and spirit, uplifting men and women by helping center their core and reconnect their whole being upon the reality that they are valuable, worthy, beautiful, and loved. Now nearly 15 years into her Pilates practice, Amy loves the "a-ha" moments she experiences every day on the journey towards an aligned spine and a balanced musculature. She also loves how the Pilates breath helps to keep her centered while attempting to balance the jobs of mother, fiance, studio owner, and instructor. Amy has a B.S. in Business Management awarded by Virginia Tech in 1994. She obtained her M.B.A. from Marshall University in 1997. Amy spent ten years honing her teaching skills as a Forensic Economist before becoming a certified Pilates instructor in April of 2007. Amy opened her home-based studio in August of 2007, and within 8 months had a client base exceeding 80 individuals. She expanded to a larger studio location in August of 2008 and expanded again to a studio on Hale Street on January 1, 2012. On February 1, 2015, she opened the current location of 108 Capitol Street. Amy currently splits her time between Charleston and Dallas, Texas. She recently joined the team at Studio 6 Fitness in Dallas and is undergoing Lagree Method training. Amy has experience with pre- and post-natal clients, golfers, runners, equestrians, and tennis (as well as racquetball and squash) players. She has also worked with clients who have undergone lumbar discectomy and knee replacement surgeries (all post physical therapy), individually and in groups. Amy strongly believes in the mission of CENTERED--she cares for the bodies, minds and spirits of each and every client utilizing the wondrous tool that is the Pilates method. Jennifer was introduced to Pilates by Amy Teter, in 2010 after lumbar back surgery. With the guidance of Amy’s expert cues and knowledge, changes occurred that come from reprogramming an off-centered body. Her core became stronger and as a result, less back pain. After one year of faithful practice, Jennifer was grateful to be living a pain free life. After a ski injury, Jennifer had herniated L5/S1. After a second, failed surgery, Jennifer was referred to The Cleveland Clinic, where a third surgery was successfully performed. Equipped with the knowledge that movement can heal, she began a new journey to pain free living. She obtained her Bodhi Suspension Certification in 2013, TRX training in 2014, and Lagree Fitness Certification in 2018. Jennifer and Amy became business partners at Centered in October 2018. Jennifer has a Bachelor Degree in Psychology from WVSU, an Associate Degree in Photography from The Art Institute of Colorado, and is currently a trainee in PAI Pilates Reformer I. She lives in Charleston, WV with her three sons, four cats and two dogs. Annette’s enthusiasm for fitness started at an early age. As a straight A student who always got a “B” in gym, she realized that being an athlete wasn’t the only way of being physically fit. Together with her mother, at the age of 16, she enrolled in a dance aerobics class offered through a local community education program. Two years later, she became certified to teach her own classes and was then recruited to teach at a local fitness facility. In 2008, as a full time working mom with a daughter of her own, she converted her traditional 1 hour workout into a 30 minute time saver workout. She decided that one could accomplish just as much in a short workout by simply making the format a bit more intense. In 2011, Annette discovered Centered Pilates. Much to her delight, Centered not only offered lunch time workouts, they offered express workouts. She took her first TRX Express class in February 2012 and became a certified instructor 6 months later. Like many others, Annette fell in love with both the strength and cardio benefits of TRX training. She also admired Amy Teter's vast knowledge of proper body alignment and the benefits of incorporating such into daily activities. Annette has a B.S. in Business Administration with a concentration in Accounting. She works full time in grants administration for the West Virginia Higher Education Division of Science and Research. She has 25 years of group fitness teaching experience with certifications from the National Exercise Trainers Association(NETA), the Aerobics and Fitness Association of American (AFFA), Mad Dogg Spinning, Kickboxing, Zumba Gold, Tracy Mallet's Booty Barre, and TRX Suspension Training. Dr. Jacqueline Stump was born and raised in Charleston, West Virginia. She completed her undergraduate studies in biology and chemistry at The University of Miami, Coral Gables, Florida. Jacqueline then attended West Virginia University School of Dentistry, graduating with a Doctorate of Dental Surgery degree in 2012. After graduating dental school she had the privilege to train and work with her two uncles and brother in private practice in her hometown of Charleston. Dr. Jacqueline enjoys maintaining an active lifestyle outside of the dental office. Being able to practice dentistry in her hometown she considers herself fortunate to be involved in multiple local organizations and charities that are committed to improving the Charleston area. Jacqueline strongly believes that her ability to preserve and beautify her patients' smiles starts with maintaining a healthy lifestyle. She enjoys staying centered by taking Pilates and TRX training. Jacqueline first experienced Centered a little over five years ago when she took her first ever Cardio Interval TRX class. It was an instant connection not only to TRX but to Centered. Jacqueline soon expanded her training to both weekly TRX and barre classes, as well as private Pilates training with Amy. When the Monday evening TRX instructor, Kim Matras, announced she was moving to San Francisco, Jacqueline knew she was ready to step in. She completed her TRX certification in January of 2018 at the Charlotte Athletic Club. "Dr. J" believes strongly that Centered is not just a gym or studio providing a variety of fitness programs--it is a Community! She feels that whether you are just beginning your fitness journey or striving to reach your peak, Centered helps you feel, move AND live better! After three years of dedication to TRX classes, Christine got certified in February 2015 at Working Out in Cincinnati, Ohio. "Like many women who try to balance exercise, healthy eating and stress management, along with the demands of work and family life, I too thought I had a handle on this aspect of my life. In the fall of 2011, I lost my father to lung cancer. I discovered that he also had Type II Diabetes. In addition, my mother has Type II Diabetes, as did both of my maternal grandparents. My mother also has severe osteoarthritis. In the early part of 2012, I was inspired by a friend to get a little more serious about my fitness routine and to start eating “cleaner”. Before this time, I had tried to: count calories, walk and talk with a friend, lift some light weights, use my elliptical machine or treadmill at home, etc. However, with co-morbid diseases in my genetic make-up, I knew I had to do as much as possible to prevent or stave off what I could through diet and proper exercise. As a Lenten sacrifice that year I decided to follow the Paleo diet and I completely gave up, - for 47 days – all artificial sweeteners including diet soda, (I never thought it was possible, now it repulses me), coffee creamer, candy, and any processed foods, etc. I also quit using dairy products and switched to almond milk and clarified butter. During this same time, I came across a Living Social deal to try Centered Pilates Studio. At the time I was a bit of an exercise whore, (in that, any offer that came along that seemed new, different, a good value and peaked my interest, I’d try). Little did I know what I was signing up for! I had been hearing for several months, from another friend, about the results she got from TRX. Finally, I listened. The first TRX class I took was challenging, but fun. The next day, I could barely walk up and down steps, could not bend to tie my shoes and it hurt every muscle in my body to laugh or move swiftly. Yet through the hurt-so-good pain, I knew if I was that sore and still had fun doing it, I was onto a life-changing experience – and I was right! I was immediately hooked by the energy at Centered! Amy, Wendi and staff are inspiring, to say the least. The focus on proper alignment and positioning are second to none and clearly so imperative to success. Within weeks I saw a difference in my appearance and by March of 2012, I had dropped 12 pounds and lost about 6 or more inches. My work continued. I still followed Paleo, although not always as strictly. And I am a regular Centered customer, fan, advocate and walking/talking billboard! I truly stop people on the street, bring it up to co-workers, friends, church members, and the like, every chance I get. I have scoliosis, I had knee surgery when I was 19, I broke my shoulder at 21, and I injured my other knee a few years ago while attempting to out-run a group of 8-year-old soccer players. I see a chiropractor and massage therapist regularly. Compared to other forms of exercise, I have not experienced knee, joint or back discomfort since doing TRX, Pilates and core barre. In fact, when my schedule pulls me away from Centered to other forms of exercise, the pain follows. I have learned first-hand how invaluable core-strengthening truly is! Tiffany is a married mother of three who has always enjoyed working out and being active. Over the years she has enjoyed step aerobics, cross fit, spinning, boxing, and running. My husband and I were married in 2005 when I immediately became blessed to be a second mother to Lauren and Garrett. They are now referred to as my “bigs” because we then had 3 “littles” of our own. (Madison, Logan, and Lucas). Due to an inguinal hernia, the littles each came via c-section on 2008,2009, and 2012 to make a total of 5 children that I love with all my heart. After college I joined my husbands physical therapy practice where my primary position was director of marketing in addition to working with patients in the clinic or helping the front desk. I was very fortunate to be part time after the littles came along secondary to nursing and navigating being nursing mom while healing from major surgery. Praise God all our children are healthy and were worth every single stretch mark. I have always been a fitness fanatic. I love my time in the gym lifting weights and I love to ride horses. After my hernia repair, I decided I needed to find new methods to help strengthen my core and close my diastases. I fell in love with Pilates. When the PAI training became available at Centered Pilates I was thrilled. Here we are a couple years later and I absolutely love what I do. PAI Certified for anatomy, biomechanics, and posture analysis in addition to receiving certifications for pilates instructor mat 1 and 2 all 5 tiers. I watched the brilliant sectional sequences heal my body from the inside out. I’m completing my reformer hours with hope to achieve that certification in the near future. I am obsessed with Booty Barre and all of Tracey Mallett’s programs. I hold certifications for several and I am working toward more. It was thrilling to travel to the Booty Barre Summit in October of 2017 to become West Virginia's first certified Booty Barre Bounce Instructor. I also co-own Improve Physical Therapy with my husband.I continue to learn more every day as I teach and watch my wide variety of clientele grow in strength and endurance and love seeing the results. Nothing is more rewarding than receiving messages about how our time together has helped them through the day or how they bought their first bikini in years. I love the "thank you's", but more so, I love the joy our studio brings. I have always enjoyed helping people of all ages find confidence and happiness as they create and reach their fitness goals. I love being part of their fitness journeys. My clients see that and also know that I am very concerned with safety and proper alignment to avoid injuries. I want everyone to have a safe, fun-filled, and effective workout and leave the studio feeling better than when they came in. I am blessed to do what I love. Jordan is a 2015 University of Charleston graduate with a degree in Political Science and is currently employed with Partners In Health Network as a Credentialing Clerk. After graduating and entering the world as a full-time employee, she began devoting time to her physical health. By discovering the power of Pilates, she noticed that her muscles were really shaping up. After a few months, her amazing results included improved posture, confidence, and increased muscle strength and definition. Because of this, she was hooked and jumped at the opportunity of becoming a Certified Pilates Instructor and is proud to be completing Mat I and II Certification through Pilates Academy International. At 5’1” in height, along with a petite, yet curvaceous figure, Pilates has given Jordan confidence, strength, lean muscles and a taller posture. She has found that teaching Pilates is a great fit because she is so upbeat and loves to help others with a goal to reveal the same positive experience, results and way of life. After many years of struggling with an eating disorder; various failed attempts to deal with chronic back pain; later weight gain; and insomnia, Mia began taking classes at Centered in early 2014. To her delight Pilates was just what she needed. Through breath, movement and proper alignment, Mia finally found the relief (and healing) she was looking for. Mia, like so many others, fell in love with both Pilates and Barre. She then expanded her practice to include private reformer sessions and Core Suspend classes. She was quickly hooked and became a daily practitioner. In 2015, Mia decided to share her love of Pilates by beginning her journey to become a PAI certified Pilates Instructor. She loves the focus on whole body health that Centered and her personal practice have brought to her life. In 2016, Mia became the retail manager at Centered when Amy decided to branch out into active wear. In addition to her teaching at Centered, Mia is currently the office manager and paralegal for her husband's law office in Charleston, WV and also works as a floral designer for Dartagnon, Events and Culinary Designs, LLC. She obtained her bachelors degree in Psychology in 2002. Meghann is a graduate of Ohio University with degrees in Performance & Choreography and Magazine Journalism. 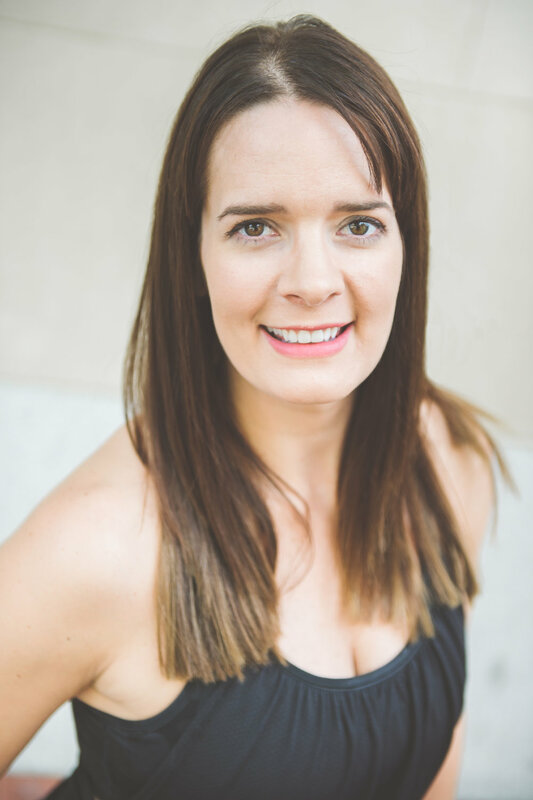 A long time movement enthusiast, she has completed training in Pilates, Barre and has over 17 years of formal training in choreography, modern dance, jazz, ballet and lyrical dance and became Pilates Mat certified through Power Pilates in 2007. After discovering how Barre combines her love of dance and pilates she became VBarre certified through Leaders in Fitness in 2012. Meghann works full time as a Public Relations Specialist and loves how Pilates and Barre make her feel balanced, centered and strong.